Johnny Depp LOVES Romona Keveza too! Jennifer Love Hewitt is a show stopper in this beautiful gown fully equipped with crumb catcher! 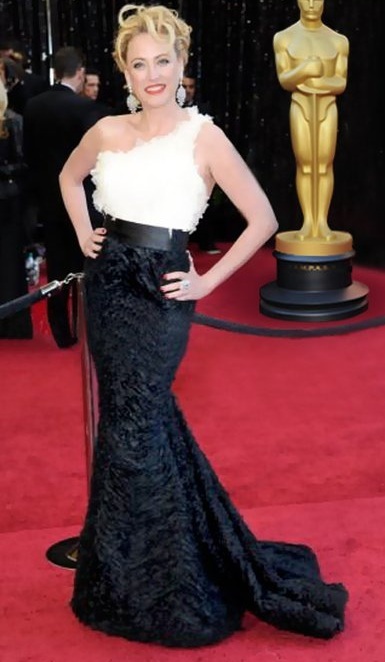 Virginia Madsen at the 2011 Oscars. Romona Keveza is an exquisite bridal gown designer. We have carried her creations since opening in 2008, so we know first hand how exceptional her gowns really are. Her gowns are luxurious, feminine and timeless. Her evening wear pieces are just as special. No wonder celebrities choose these creations for their moment on the red carpet! Many of her wedding gowns translate beautifully into evening wear, making her one of the most sought-after bridal gown designers in North America. Our brides feel like a million dollars and a real star when wearing one of her gowns.